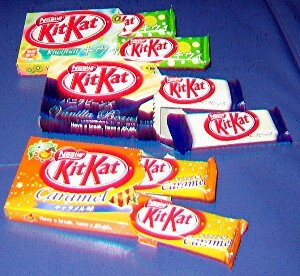 Vanilla Beans KitKat tastes exactly like vanilla frosting. It has a pleasant vanilla fragrance, and it’s extremely creamy. The white chocolate coats your tongue a little. Nice. These were by far my favorite, although I think they would be much more accurately described as butterscotch. They look like regular chocolate KitKats but with caramel tiger-stripes. They’re very rich, the caramelized-but-not-burnt sugar flavor overpowers the chocolate a bit, but they still blend nicely and have a really buttery finish. I’m gonna stock up on these for the inevitable day when this limited edition gets pulled off the Conbini shelves. but would exit a shop swiftly if i saw a kiwi one. actually, the caramel ones might be similar to the caramac ones we had here a while back, they were GOOD. AntFan, the only way to get there here in the US is through Ebay or JBox.com (unless you have a friend in Japan who\’ll mail them to you). 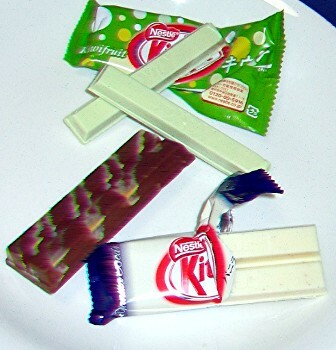 anyone no a good website to get some japanese candy? I have only tried Vanilla Beans and Caramel of these three, but I agree with you on both of them. I just had my last Caramel KitKat yesterday, and it was even beter than I remembered. What a smooth, delicious texture…so sad to see these go. The Vanilla Beans is good, but not as good, and reminded me of vanilla ice cream. I also got a Cookies and Milk KitKat around the same time that was also fantastic, but I’ve always been a big fan of the Hershey’s Cookies and Creme bar and it tasted a lot like that.